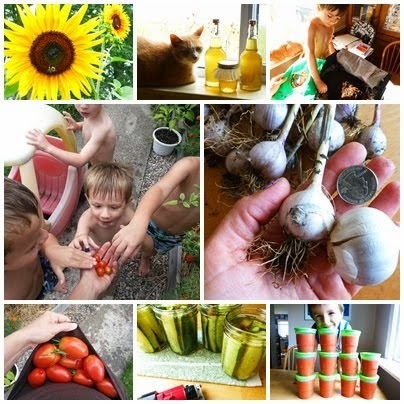 little*big*harvest: Our First CSA Bundle! For now, the shades of green are as beautiful to me as any rainbow. 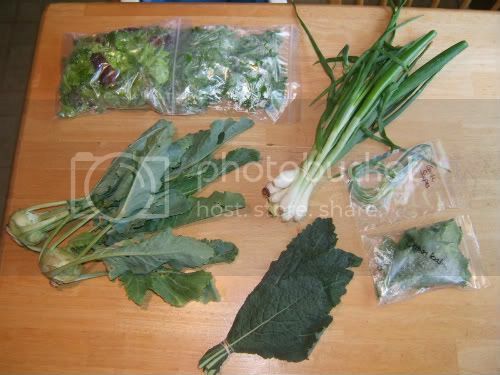 Tonight's share included kohlrabi, kale, salad greens, arugula, spring onions, garlic snapes and lemon balm. What are garlic snapes? Lemon balm? Exactly what I wondered...and Wendy (the farmer herself) enthusiastically explained. Garlic snapes are the green growth of the garlic plant that needs trimmed in order for the garlic bulb to grow to its full potential. Lucky for us garlic lovers, the snapes are just as good as garlic and can be used in the same way. Lemon balm? An herb that is great for tea...or, as some people claim, great to rub all over your skin as a natural mosquito repellant. You know I just have to try that! Half of the onions went into tonight's supper (tuna casserole), and one of the kohlrabis disappeared before supper was even prepared...not even an hour after bringing the share home. I peeled and sliced it, thinking I might roast both of them to go along with supper...but the memory of my grandma's kohlrabis got the better of me, and I had to start eating it. Memory explosion! My grandma grew these and sliced them up raw for our supper often. Craig (my other half) wandered in (a strange habit he has when supper is cooking) and said he had never had kohlrabi before, so I handed him a slice. He loved it! Yay, score one point for the lady trying to get her family to eat healthy! Sorry kids...perhaps you can try the next kohlrabi! So, tonight was the start of my weekly Thursday evening date with Wendy the farmer. It feels amazing to finally be supporting local organic food growers. Meeting Wendy tonight was a treat--she is a fun lady who makes you feel like you've been friends for ages. She mentioned that the farm has a facebook page, so I checked it out and 'liked' it. There is a ton of info on their page for me to check out! And if you are wondering what is up with the Little Hands garden...we have been busy, and we do have some exciting photos to share of our progress. Coming SOON! We have garden boxes built, the soil is in them, the plants are in their new homes!